The Iridium satellite networks comprises many satellites in low earth orbit. At the last count there were 66 operational Iridium satellites and 13 in-orbit spare Iridium satellites. The satellite are in 6 groups. Each group is in its own polar orbital lane, spaced 60 deg apart in longitude. on the figure below each orbit appears twice, first the satellites move north and then over the north pole and down the other side. Think of each of the 12 columns of satellite slowly moving up or down in a north or south direction so that each satellite orbits the earth every 120 minutes or so. Each satellite look downwards and has a beam coverage circle about 1800 miles in diameter with each beam overlapping a little into the next coverage. This way you achieve continuous operation as the phones had off t the next satellite - rather like a car driving along and moving into and out of each terrestrial cell phone coverage area. 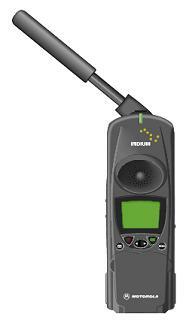 The Motorola Iridium phones customer phones are portable hand held devices a with an antenna rather larger than for regular mobile phone handsets. Insert SIM card, battery, charge battery, flip the antenna round from its stored position at the back and make your phone call - anywhere ! The Iridium project has had its ups and downs but is no a great succerss. Iridium has a mix of commercial and military customers, totalling some 850,000 subscribers (Dec 2016).